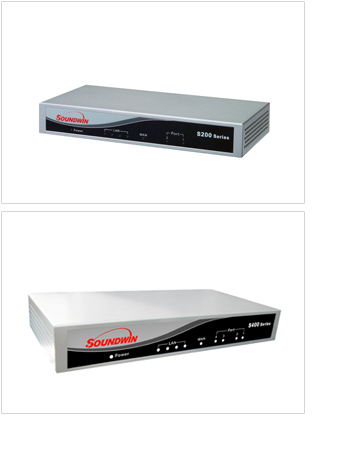 VoIP Gateway, VoIP Gateway H.323/SIP S200(2FXS) - Soundwin Network Inc.
S200 series VoIP Gateway allows the customer to call over VoIP to save the international call fee and no need to change the dial behavior. 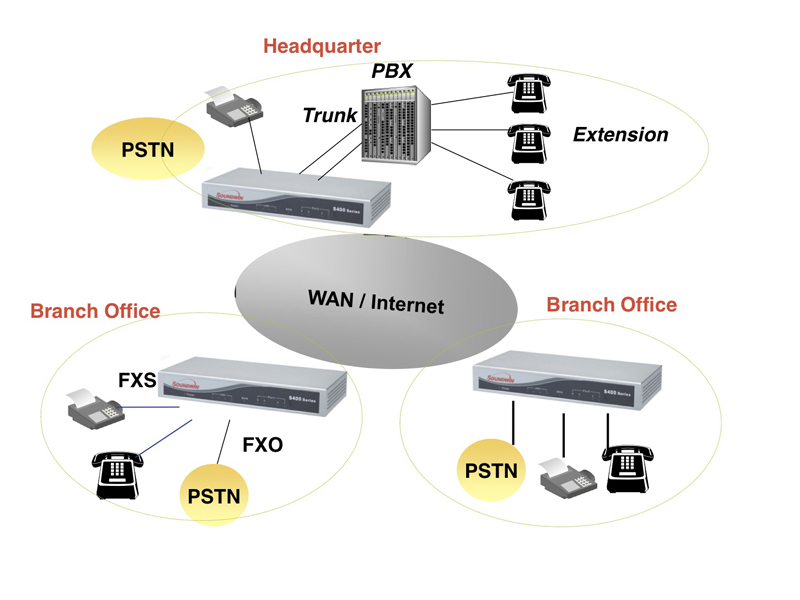 S200 series gateways provide 2 FXS/FXO connect the analog phone, PABX trunk/extension card or PSTN line, support 2 voice channels. ‧ Voice channels status display, easy to manage. ‧ Web-Based Graphical UI Configuration, easy to configure. ‧ SIP Registration and Digest Authentication Mode; H.323 Gatekeeper Registration. ‧ SIP Single Number / Account for multiple ports. ‧ Caller ID Delivery: FXS support DTMF Caller ID generation. ‧ Flexible and Smart VoIP call Dialing Book: VoIP call Book could provide any application VoIP call to any type destination (Domain name / IP address, PSTN or PBX) or hunting number setting. ‧ NAT traversal: This feature allow gateway to operate behind any NAT/Firewall device. Need not to change any configuration of NAT/Firewall like setting virtual server. ‧ Smart-QoS: This feature provides good voice quality when user place a VoIP call and also access internet at the same time. The gateway will automatically start to reserve bandwidth for voice traffic when VoIP call proceeds. ‧ Call Hunting Facility: This function helps gateway to use the lines effectively. This facility automatically transfers your incoming call to a free line. Subscribers need not indicate numerous numbers of each port of gateway. ‧ Voice channels status display: This function display each port status like as on-hook, off-hook, calling number called number, talk duration, codec. ‧ Flash Detection and Generation Program: FXO support Flash Generation and FXS support Flash Detection. ‧ FXO answer Mode : FXO provides Ringing Answer, Connection Answer and Non Answer for configuration. ‧ FXO anti-seized mechanism : FXO provides busy tone auto-learning and manually configuration busy tone learning. ‧ FXS Tone Table Configuration: Support tone frequency and cadence configuration. ‧ Answer supervision: Support Battery Reverse Detection and Voice Detection. ‧ FXO answer delay time: Support delay 0 – 8000 ms to answer. ‧ H.323 v2/v3/v4 and SIP (RFC 3261) , SDP (RFC 2327), Symmetric RTP, STUN (RFC3489), ENUM (RFC 2916), Outbound Proxy Support, RTP Payload for DTMF Digits (RFC2833). ‧ Network Address Translation: Providing build-in NAT router function.